By now, most of our patients understand the benefits they receive from brushing and flossing daily. From enjoying better oral health to improving the freshness of your breath, a solid daily oral hygiene routine – combined with regular visits to see your Eugene dentist – can make a huge difference to the long-term health of your teeth and gums. Of course, quality oral health also offers other benefits many patients might not expect. In recent years, studies have suggested that a healthy mouth could also mean a healthier heart. How can the health of your teeth and gums possibly impact the health of your heart? Well, our bodies are far more connected that what many health experts had previously believed. A growing amount of research has found compelling links that suggest bacteria that originates in the mouth can travel to other parts of the body causing inflammation to develop. Inflammation is the root cause for all systemic disease in the body. While some studies have identified a link between heart disease and gum disease, a clear cause-and-effect relationship has yet to be firmly established. In other words, while research show that a connection exists, it’s currently unknown whether gum disease increase the risk of heart disease or whether heart disease increasing the risk of gum disease. Either way, what these and other studies suggest is a need to make our oral health a top priority to lower our potential risk of disease. When it comes to enjoying quality oral health, here are a few helpful tips for keeping your mouth healthy, plus a few ways you can recognize the early warning signs of gum disease. Daily brushing and floss. When combined with regular dental visits to see your Eugene dentist, brushing and flossing rank as the most effective habits for successfully lowering your risk of gum disease and tooth decay. Improved lifestyle habits. Smoking or using tobacco products of any kind increases your risk of gum disease. If you drink a lot of soda or enjoy a little something sweet in your coffee or tea, you have a higher risk of developing tooth decay. By eating a more balanced diet rich in fresh fruits and vegetables, drinking plenty of water and not using tobacco products, you can help lower your risk of tooth decay and gum disease while enjoying a fresher, healthier mouth. Understanding your risk. Oral risk factors also play a role in determining your oral health. These factors can include having a family history of gum disease, a weakened immune system and a genetic predisposition to gum disease. Hormonal changes that occur during pregnancy and puberty can cause changes to the gums in some instances, leading to the development of gingivitis, an early stage of gum disease. Differentiating gum disease. There are two types of gum disease. Gingivitis – an early form of the disease – only impacts the health of gum and soft tissues surrounding teeth and is easily reversible when treated early. More advanced forms of the disease – such as periodontitis – can destroy the gum tissue and bone structure that holds your teeth into position. Periodontitis ranks as the leading cause of adult tooth loss in the U.S.
Identifying a problem. Healthy gums should appear pink and firm. However, signs of gingivitis include tender, red or swollen gums that bleed easily during brushing. Often these symptoms go overlooked by patients because they don’t experience any discomfort. Unfortunately, by the time you may experience any pain or difficulty eating or drinking, the disease has progressed to a far more serious condition that could threaten your long-term oral health. 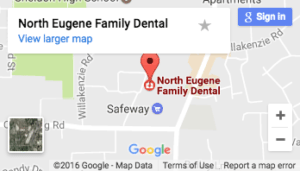 If you think you might be suffering from gum disease, it’s important that you schedule an exam with your Eugene dentist at North Eugene Family Dental. Don’t neglect your oral health until it’s too late. A little prevention now can go a long way towards improving your long-term oral and overall health. This is what people needs to realize. With a healthy oral health, it can improve your overall health performance also. It’s a good thing you are able to post this one so people will have an idea of the importance of protecting and keeping your mouth healthy. This is some really good information about oral health. I like that you talked about how important flossing is. I was terrible at flossing as a kid. So, It does seem like something that would be good for me to really stress that my kids do.